A coronary artery spasm is a sudden tightening of the muscles within the arteries of the heart. When this occurs, the arteries get narrowed and prevent blood from flowing to the heart. 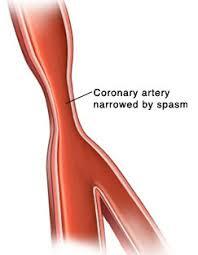 Coronary artery spasms are also known as coronary artery contractions. Use of illegal stimulant drugs, such as amphetamines and cocaine.